...Enjoying Life...: SSS Blossoms And Butterflies Release Blog Hop + Giveaways! Welcome to my blog! 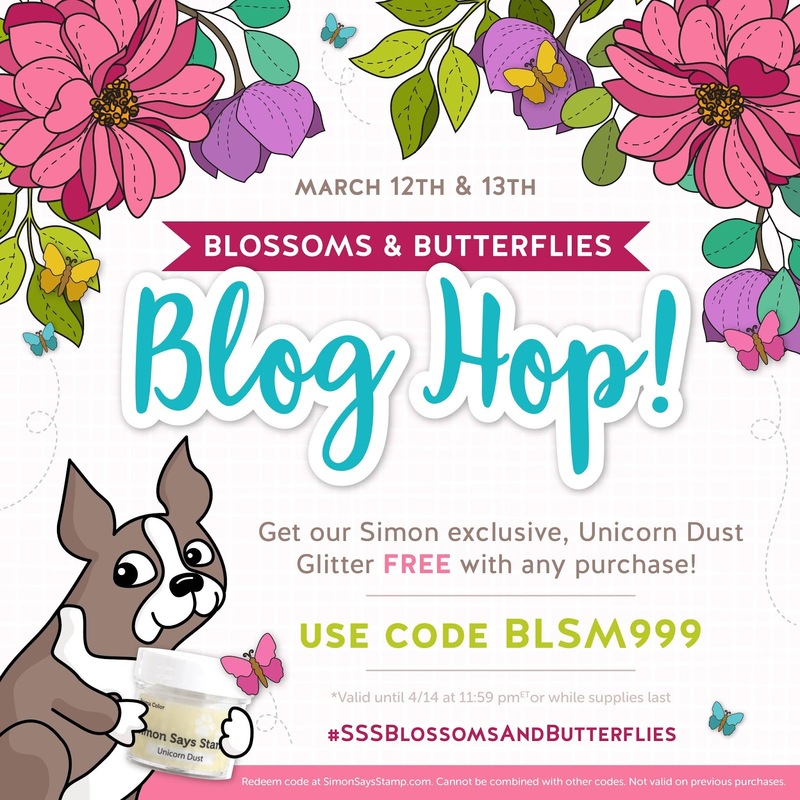 It's day 2 of the Blossoms and Butterflies release blog hop from Simon Says Stamp and I'm so excited! You should've arrived here from the talented, Bibi Cameron's blog. If you'd like to start at the beginning of the hop, head over to Simon's blog. If you missed day 1 of the blog hop, click here. As you can see in the banner above, Simon has a code for you to use to receive FREE Unicorn Dust Glitter! The code is BLSM999 and you can use it at checkout, with any purchase, while supplies last. Simon is also giving away a $25 gift certificate for every stop along the hop! Just leave a comment below for a chance to win. Did you know Simon has galleries for each of their releases and card kits, and even a video gallery? It's true and you can add your very own cards and projects to these galleries! Here's a link to the Simon Brand Galleries. I received some awesome products to play with for the release and I had so much fun! On my first card, I used the, Sketchy Lines Background stamp with a couple of Distress Oxide Inks. The "gah" die-cut was created from the, Archie Jr Solid Alpha die set and the rest of the sentiment is from the fabulous, Tiny Words Encouragement stamp set. I used the same Tiny Words Encouragement set on my next card, along with an Alcohol Pearl Inked background. There are so many perfect sentiments in this set to uplift, inspire and encourage. It's a must have! Up next is this gorgeous, Floral Mix Background stamp! Gosh, I loved coloring this one! I used Copic Markers. I though it would be fun to cut (gasp) the colored panel in half, pop them up with foam adhesive and stamp a sentiment in the center. It's another one from the Tiny Words Encouragement set. With this release, there are also several beautiful Floral Frame dies. I was lucky enough to be able to play with the Poppy Frame Die and created this clean and simple card. The background was shaded with Distress Oxide Inks and I just quickly colored the die pieces with Copics. And yes, you guessed it. Another sentiment from the Tiny Words Encouragement set. Told ya it's a fabulous set! Okay, have you guys ever ordered Suzy's Watercolor Cards? I absolutely LOVE these paintable prints! They come in packs of 9-16 cards that are already printed with beautiful images that you can color with markers, pencils or watercolors. I was sent her newest pack and they are so beautiful and fun to color! I'm sharing three of them today. This first one was water colored with Zig Markers. And the next two were colored with Copics. I mean, aren't they perfect for springtime?! Some of them come with a printed sentiment, like the Mother's Day card above but others do not, so you can add your own, which I've done on the other two. So that's it for me. I hope I've inspired you and given you some ideas on using a few of the products from this awesome release! The next stop on the hop is the very talented Ankita Gupta! Affiliate links to products used at no extra cost to you. Thank you for your support! Beautiful array of cards. I especially love the floral background card. Thanks for all your examples. Love each one. So much color and fun involved in each one!! As always your cards are stunning Barb, love all the colouring so pretty!! So many wonderful cards! You've outdone yourself. I especially love those florals. I love all the florals you created.. the colors are awesome.. Your cards are so beautiful! I love them all! Love your card and the sentiment you custom created! Those alpha's are adorable! Wow! What a beautiful line-up of inspiration! I think the flora mix background card is my favorite of all --- it so cheerfully "shouts" spring! Wow, so many stunning designs! Especially love the floral background...it really pops! Fantastic cards. Thanks for sharing so many of them!!! Fantastic projects. Love the first. What a wonderful and diverse set of cards you have created Barb! All so pretty and different with their various techniques and colours! Thanks so much for sharing your wonderful inspiration! Oh, my, I love all the cards that you colored. Great to hear about Suzy's watercolor cards and that they can also be colored with alcohol markers. I was wondering about what type of card stock is used because it's watercolor cards. Thanks for sharing and posting. You have been busy, your cards are fantastic! Beautiful cards! I love the different designs you came up with and the coloring is gorgeous! I really love the new background stamps & you've made magic with them, Barb! How lucky to get Suzy's set of cards! I keep putting them on my wishlist, but never order since I'm afraid I'd just ruin them. Hope you've survived the storm! An array of beautiful projects, thanks for sharing Barb! So many fabulous cards. Can’t pick! Thanks so much for the inspiration. I just ordered the floral background stamp and the poppy die last night. It was meant to be! Gorgeous cards!!! gorgeous cards Barb, you can see that you where enjoying yourself. I love that you showed so many different mediums and approach. Thank you so much for this great inspirational post and have a great Sunday. Lovely cards. I can't wait to try to make some backgrounds like yours...stunning! Lovely group of cards! your coloring is amazing! Each card is so unique! I can tell you had a lot of fun with this collection, thanks so much for sharing your creations! Such a fabulous array of cards!! The one using the Poppy Frame Die is my favorite!! Wow! Gorgeous! I love the floral background and those floral frame dies. Your poppy card is so beautiful. The floral mix background stamp is my favorite. Love the way you colored it too. So many choices this time. You have been busy. Thank you for sharing and the inspiration. I'd say you were inspired by the new release:):) They are all just gorgeous, and your coloring is superb! Tons of wonderful examples of cards- so many pretty designs. My favorites are the ones you colored in towards the end of you post with the Copics!!! Such marvelous and spectacular color combos! Love the hibiscus it reminds me of when I lived in Hawaii. All so pretty and unique by design. What a wonderful assortment of cards! Your coloring is terrific. And yes, those tiny sentiments are super! Great cards - lots of great products in this release! Thanks for inspiring us! Such gorgeous cards! You highlighted this release very well! The cards are absolutely beautiful! This is such a great release. I really love the new dies and the background stamps. My Goodness...you are way to creative!! Love all your creations!! Wonderful set of cards, love the colors and different examples thanks for sharing your inspiration! I love the idea of cutting the image in half and putting the sentiment in the middle. I'm going to try it! Beautiful cards! Your copic coloring is awesome and I really love the Sketchy Background and the large floral background. Your cards are absolutely gorgeous! I love the colors. The floral background stamp is definitely one of my favorites from this fantastic release. Beautiful cards! Thanks for making so many examples. All are incredible! You really know how to color flowers! Just stunning! Your cards are all beautifully colored. I love the color combinations. Holy Moly Frijole...7 beautiful cards!!! I loved them all. What beautiful crafting talents you have. Thank you so much for sharing your beautiful work today. I hope you are enjoying a wonderful weekend. Hugs! Beautiful cards. Definitely gives me ideas. Would never have thought to cut the stamped image in half after coloring it, but I love the way it turned out. Beautiful cards! I am in love with the hydrangea! Gorgeous! Absolutely gorgeous! I am smitten with your card created with the floral background stamp. Wow! I love every single card! Each one is so beautiful! You are so talented! I love all of these beautiful cards! You had me at GAH! And then it got better! HA! Very pretty cards! Thank you for sharing!!! coloring can be so therapeutic right!....you did a beautiful job. Amazing array of beautiful cards! Thanks for sharing SSS new release. Love the coloring of your cards. So beautiful. Lovely job. Great use of the SSS products. Thanks for sharing your creativity! you have outdone yourself this time Barb, Simply beautiful cards that showcase the release to perfection. OMGOSH, so many beautiful and diverse cards from this fabulous new release! You have been such a busy girl, but there are so many beautiful products to play with. Loved each and every card! Thanks so much for giving me so much inspiration - loved your designs and your colouring is phenomenal. TFS. Wow!!! What a bunch of STUNNING cards!!! Thanks for all the wonderful inspiration!!! Wow so many beautiful cards ! Thanks for all the inspiration! Beautiful cards! Love your gorgeous coloring! Wow you made a lot of cards from the new release. All your projects are lovely. Oh my Goodness!!! looks like you had A LOT of fun!!!! I Love your coloring!! all of these are beautiful, but I gotta say, that "GAH" card has to e my fave!!! simple..elegant...meaningful!!! LOVE IT!!! TYFS!!!!!!! Love all of your cards!! How many fabulous inspirational samples!! All adorable! Love the Words Encouragement set, it's so useful! Your cards are so lovely and stunning. What a variation! Thanks for sharing! These are all stunning. Your coloring is flawless. I need to color more but I just don't have the patience. Superb cards - those sentiments are so wonderful!! Oh my goodness!!! So many wonderful projects. Thanks for the great inspiration! Oh my WOW! Your coloring is so amazing, especially the last two cards!!! And the third one - LOVE that you cut the panel like that - really adds so much interest! That floral background stamp is so pretty! Love ... love of your cards !!! Stunning cards - great inspiration. I love your bright colouring too. Fabulous cards, Barb, I especially love the second one, with the alcohol ink background! You clearly had lots of fun with making these! Seven beautiful examples from this wonderful release! Woohoo! You've been busy. I really like the way you cut your floral card in half & popped up the sentiment. Thanks! Such a wonderful set of cards. Love them. Wow - thanks for sharing so many amazing cards with us. It looks like you had a ton of fun creating! So many great cards, thanks! All are so beautiful but that floral mix one is spectacular!! Your coloring skills are awesome!! Thank you for your Inspiration!! So many beautiful cards. My favorites are the poppy and the zinnia cards. So pretty. All of your work is gorgeous--I love this latest release, it's so pretty. I'm just crazy about flowers! That "Gah, Your amazing" card is so fun! Loving all of your cards! SO much inspiration. I smiled out loud at your first card and I think I'm in luv with the sketchy lines! Love all your cards! lots of inspiration here. So many fabulous cards! I love the Gah! card - so much fun! Fabulous cards! Love all your different coloring ideas. Gorgeous set of cards!!! Love your colouring!!! I really like how you showed off a bunch of different techniques in your cards. They are all so pretty, and they really show off this release. Thanks for sharing your creativity with us! Beautiful coloring and cute cards! WOW...love ALL your beautiful cards, Barb! Your Copic coloring is just sensational! Thanks for all the wonderful inspiration using the awesome new Simon products in the new release! If you hoped the cards would be an encouragement to their recipients, you hit the nail on the head! I have just finished my exercise prescribed by my physical therapist and my body is aching all over. Then I looked at your blog and find a card that says "Hang in there! This will all be worth it!" :) THANKS SO MUCH for that emotional boost when I needed it. The other cards are simply beautiful, especially the one of the floral background that you Copic colored! GORGEOUS! So much inspiration!!!! Everything is so beautiful! Wow, so many inspirations, love each one of the cards. Wow what wonderful and gorgeous cards..I love this release.